How is your health affected by the environment? Can nature improve quality of life? 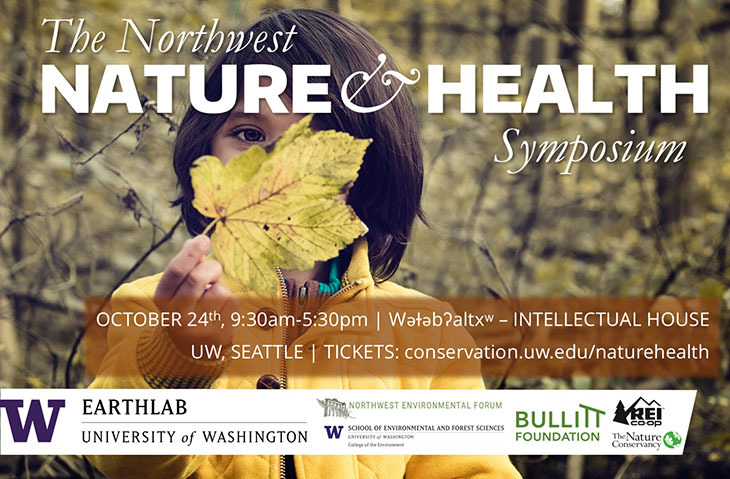 Join UW’s Earth Lab at the 2018 Northwest Nature & Health Symposium, October 24th, UW Seattle. Registration is now open for the second annual Northwest Nature & Health Symposium to explore the human health benefits of nature through discussions, workshops, and lectures by experts in the field. October 24th, UW Seattle. How can we harness the power of nature to benefit human health? Join the 2018 Northwest Nature & Health Symposium as we listen, learn, and discuss the latest developments in the field. health benefits of contact with nature, from indoor settings to wildlands. For more informtaion or to register visit the UW EarthLab web page.